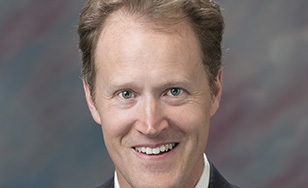 Rick Revoir, associate professor and co-interim dean of the School of Business and Technology, has been appointed to a second six-year term on the Duluth Seaway Port Authority Board of Commissioners. The Duluth Seaway Port Authority is governed by a seven-member Board of Commissioners-two appointed by the Governor of Minnesota, two by the St. Louis County Board and three by the Duluth City Council. Revoir was appointed to serve by the Duluth City Council, effective Oct. 10, 2018. "The port is such an important part of our community," Revoir said. "One of the missions of the Port Authority is economic development and we're continuing to create jobs - our intermodal facility has really taken off. It's great to be part of that growth in our regional economy." At St. Scholastica, Revoir serves as chair of the Accounting, Finance and Economics Department and is director of the College's Sandbulte Center for Ethical Leadership. He has led four study abroad trips to China and another to Ireland. Prior to joining St. Scholastica in 2004, he worked for 11 years in healthcare finance. Revoir earned a doctorate in education from the University of Minnesota-Duluth, an MBA from Arizona State University and is a Certified Public Accountant (Arizona license). He and his family live in Duluth.